In antiquity, Roman schools of grammar and rhetoric. Today, Opus Fundatum Latinitas. Greatest extent of the Roman Empire. Latin was by no means confined to these regions, and Koine Greek, Coptic, Syriac, and other native languages dominated the eastern half. Latin ek purana bhasa bhasa hai jisme Roman log baat karat rahin. Aaj kal bahut log ii bhasa me nai baat kare hai, lekin school me bahut students log iske sikhe hai. Latin, Roman Catholic Church aur Vatican ke official language hai. Science aur medicine ke dher sabd Latin se banawa gais hai, nai to Latin sabd hai. 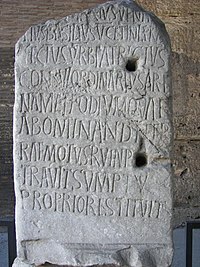 Dui rakam ke Lain hai: Classical Latin aur Vulgar Latin. Classical Latin, Romans log ke khatir literary standard rahaa, Roman Catholic Church aur students logan use kare hai. Vulgar Latin, uu bhasa rahaa jisme Roman logan jaada kar ke baat karat rahin. Latin, Middle Ages ke ek khaas bhasa rahaa. Iske sab European schools me parrhawa jawat rahaa, aur sab universities Latin me parrhat rahin. Reformation ke time se Latin aapan importance ke lose kar diis hai. Dher bhasa jisme aaj kal baat karaa jaae hai Latin bhasa se aais hai. Ii bhasa ke Romance languages bola jaae hai. Paannch sab se barraa Romance languages hai French, Romanian, Italian, Portuguese, aur Spanish. Aur Indo-European languages bhi Latin se related hai. Latin ke structure Ancient Greek ke rakam hai lekin ii different alphabet use kare hai. Latin me noun cases hai jisme se khaali paanch unique hai: Nominative, Genitive, Dative, Accusative, aur Ablative. Latin ii plaque me likha hai: "1883 ke saal me, baarah baje ke baad, duusra aur tiisra ghanta ke biich me, Emperor Francis Joseph, kuch log ke saathe, library ke aapan presence se honour karie." Ek aur case, Vocative case, lag bhag Nominative case ke rakam hai. Latin nouns ke decline, nai to badlaa jaae hai, according to how they are used in the sentence. Ek noun ke paanch rakam se decline karaa jaae hai. ↑ Opus Fundatum Latinitas is an organ of the Roman Catholic Church, and regulates Latin with respect to its status as official language of the Holy See and for use by Catholic clergy. Ii panna ke 9 December 2013, ke 17:09 baje, pichhla time badla gais rahaa.